Grain legumes are important crop plants, both as biological fertilizers through symbiotic nitrogen fixation as well as valuable protein source for livestock. Europe is importing enormous quantities of soybeans to meet protein demands in animal husbandry, although in principle it could produce parts of its needs with domestically produced grain legumes, such as peas. The pea moth Cydia nigricana (F.) and the pea weevil Bruchus pisorum (Linnaeus) are serious pests of peas, alongside with a number of fungi. Yield losses can be high, especially in organic farming. 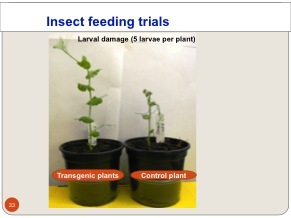 Resistances against insect pests has been established in other crop plants through the use of proteins derived from the soil bacterium Bacillus thuringiensis (Berliner). This method was used at the lab of Prof. Dr. Hans-Jörg Jacobsen of the Plant Genetics Institute, at the Leibniz University in Hannover, Germany, to generate genetically modified peas with resistances against these pests. Genetically modified pea lines expressing antifungal genes were also developed. The antifungal genes expressed in the transgenic lines are polygalacturonase-inhibiting protein (PGIP), stilbene synthase, glucanase and a novel chitinase. These genes are either expressed as single insertions or in various combinations after several generations of transgene breeding. The work was in part funded by EU-projects. Greenhouse and lab assays successfully conducted, and field experiments with Bt-expressing peas resistant against the pea weevil are on the way. However, this field research will for the known reasons (vandalism) not conducted in Germany, but have been moved to Canada. Over the last two years, the incidence of scientific field trials being vandalised and destroyed by radical anti-biotechnology activists has drastically increased in Germany. It hit a record in 2009, with 42% of field trials in Germany being destroyed – despite expensive security and surveillance measures at the field sites, and extensive communication efforts by scientists to inform the general public, both before and during the release experiments. A number of investigative scientific projects could not be finished, including some especially focused on the biosafety and environmental risk of genetically engineered crop plants. The data on field trial locations have to be made public in an online register, thus disclosing the exact location of the individual trials and facilitating vandalizations and destruction of the trials. Since even costly security measures cannot guarantee the completion of these public sector field-release experiments in such a malicious athmosphere, and having learnt from the experience of previously destroyed field trials, the release of genetically engineered peas was relocated to North Dakota State University. Pea production in North Dakota is suffering from similar problems with fungal infections. The cultivation of genetically engineered peas with resistance against the pea moth and/or the pea weevil could substantially reduce the use of insecticides in these legumes, safeguarding higher quantity and quality yields, even under high pest pressure. This would have direct beneficial impacts on the environment, human health, production costs and profitability of these crops. Organic farmers could especially benefit from these plants, since there are now plant protection methods that could be used against these pests that ensure an acceptable and reasonable level of protection and reduce the need for synthetic pesticides.